Émile Driant, born 11 September 1855, was a Lieutenant Colonel in the French army, a politician, and he was also a novelist. Quite an interesting combination. Especially the fact that he was a novelist, which I will discuss a bit later. Driant was groomed for a military life from a young age. In 1877 he graduated from the Saint-Cyr military academy as an Army officer in the infantry. In 1886 he went to North Africa to join the 4th Regiment of Zouaves. He was also promoted to the rank of Captain at this time. A successful military career seemed certain. In 1888 Driant married the daughter of nationalist General Boulanger. A decision which would come back to haunt him several years later. Between 1892–1896 he worked as an instructor at the Saint-Cyr military academy, the same academy from which he himself graduated, In 1899 he was given command of the 1st Battalion of Chasseurs. He held this position until 1905. It was in 1906 that his decision to marry the daughter of nationalist General Boulangera caused him career problems. It seems due to this inappropriate connection he was banned from further promotion, so he resigned his commission in the army. Driant now turned to journalism and politics. It turns out he was well suited to politics. In 1910 he was elected to the Chamber of Deputies as a representative of Nancy. Whilst in this role he dedicated his time to strengthening France's defences. Then in 1914 after the outbreak of WWI he was pressed back into military service. He was promoted to lieutenant colonel and given command of two infantry battalions, the 56th and 59th chasseurs reservists battalions. Even during this time he maintained his seat in the Chamber of Deputies, and with that his continued political stance of strengthening France's defences. In December 1915 he came into conflict with Marshal Joseph Joffre, the General in command of Western Front forces. Joffre ordered the removal of a substantial portion of the artillery and infantry from the fortifications at Verdun and Toul to strengthen over areas in the Western Front. Driant was vehemently opposed to this action. He believed this was a huge mistake and would lead to disaster. In what was perhaps an eerie foretelling of his own fate, Driant was, sadly, correct. On 21 February 1916, German forces mounted an assault against the French in the Verdun sector. 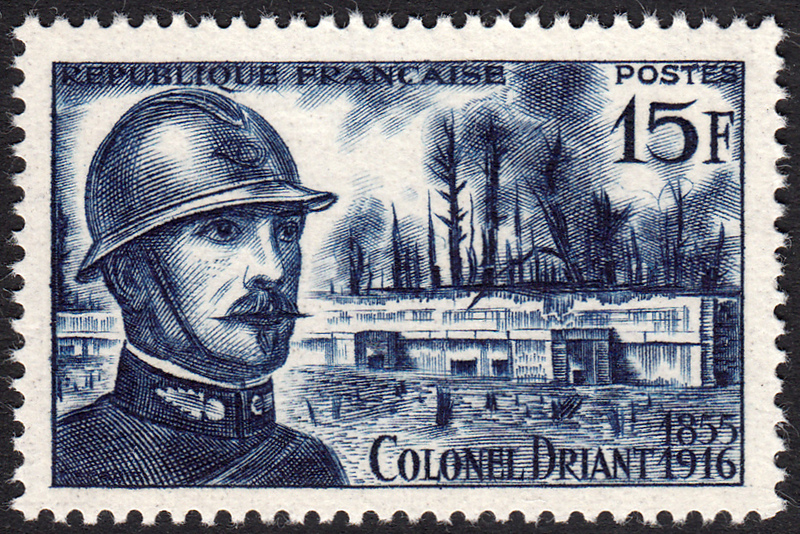 With 1200 men by his side Driant fought valiantly against the German onslaught for nearly two full days. Only when the situation was totally hopeless did he order a withdrawal of French troops. It was during this withdrawal that Driant lost his life. He was the first high-ranked casualty of the Battle of Verdun, and he was hailed as a hero among the French. And the efforts of he and his troops are commemorated every year on 21 February. Driant was not only a soldier and politician. He also fancied himself as wordsmith. In 1888 under the pseudonym "Capitaine Danrit" he penned his first novel. The book comprised three "imaginery war" stories. In the stories the French win a series of sweeping victories over the Germans. He also wrote another epic tale of some 1200 pages, called "The Fatal War: France-England" in which the French won a great victory against the British. 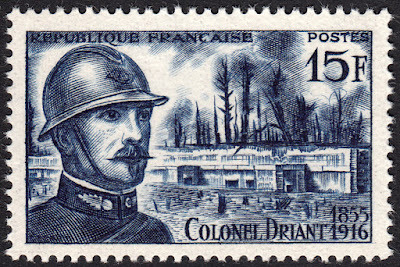 On 21 February 1956, France issued a stamp commemorating Colonel Émile Driant. The stamp was designed and engraved by Albert Decaris. This excellent composition reveals a brave and idealistic man. We may perhaps even see a hint of his artistic inclinations in his pensive gaze. 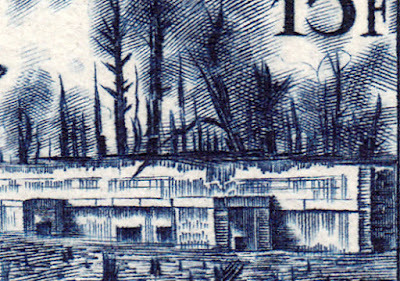 In the background we see the stark reality of war represented by fortifications - presumably those at Verdun - and the skeletal trees reaching with vain hope toward the sky. A marvellous stamp! 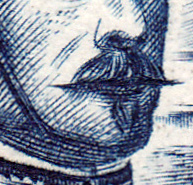 And I'll also give this one extra credit for the superbly engraved moustache!